Hello! Welcome to the website of our guesthouse Pen-sion Apartman Janov, which offers fami-ly accommodation in the Jizera Mountains, the Czech Republic. In our guesthouse in the Jizera Mountains you can spend a pleasant active holiday in the mountain town-let of Janov nad Nisou. 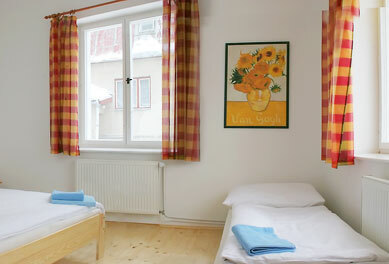 Our townlet together with the villages of Hrabetice and Bedřichov forms a sport – recreational area. The big towns of Liberec and Jablonec are nearby. The guest house was completely renovated a few years ago. Our apartments are modern and comfortably fur-nished. Each apartment has a kitchenette with a refrig-erator and a microwave oven, and a private bathroom with shower. Apartment no. 1.A four-bed apartment with one extra bed for a child (160 cm), with two bedrooms and a separate dining area with a kitchenette. Price per apartment per day CZK 1,450. Apartment no. 2.A three-bed apartment with a separate dining area and a kitchenette. Price per apartment per day CZK 1,150. Apartment no. 3.A four-bed apartment with one bedroom and a sepa-rate dining room with a kitchenette. Price per apart-ment per day CZK 1,350. Apartment no. 4.A three-bed apartment with a separate dining area and a kitchenette. Price per apartment per day CZK 1,150. Apartment no. 5.A double apartment with a kitchenette. Price per apartment per day 750 CZK. Apartment no. 6.A double apartment in attic with a kitchenette. Price per apartment per day 750 CZK. Apartment no. 7.A single apartment with a kitchenette. Price per apartment per day 450 CZK. The Jizera Mountains are ideal for families and sporting holiday. The villages of Hrabětice and Bedřichov are ski resorts. Both the places are accessible by bus, that stops 50 meters from our guest house. The whole Jizera Mounatins are covered with a dense network of cycling routes. The cycling routes start right near our guest house. In our guesthouse you can borrow bikes. We can also lend you an electric bike that will enables you to get to the popular cycle routes of the Jizera Mounatins, and take you to the remotest places during your short stay. The Jizera Magistral is carefully maintained for cyclists and skiers. The cycling routes and ski routes are very well marked. In winter the Jizera Magistral offers over 150 kilometers of ski tracks. The tracks are renewed regularly.